Dirty Dan is one of Darwin's most renowned musos, known for his ability to combine awesome lead vocals, dynamic drumming and hilarious jokes as he interacts and has fun with the crowd. Dirty Dan and the Rockets available for pubs, clubs, taverns, weddings, party's and corporate functions Australia wide! Darwin-born Danny Thomas aka Dirty Dan, is a diverse entertainer who has performed with some of the best in the industry, including Steve Wright (Easy Beats), Rogues, Bondi Cigars, Mental as Anything, , Col Elliott, Ted Mulry Gang, Tom Curtin, Autos, Whiskey Creek, to name a few. Groovin' Graeme Aitken from the hills of Victoria has honed his skills performing with the cream of the Australian music industry, Men at Work, Autos, Mondo Rock, Giants, Barfly's, Radiators, and Iron Stone. 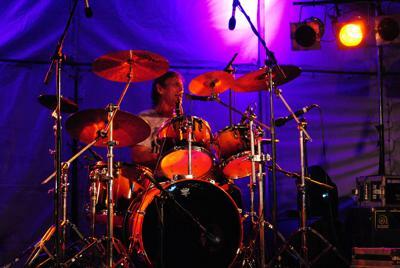 Groovin' Graeme creates the ultimate driving force and passionate bass rhythm behind Dirty Dan & the Rockets. Mark Hines completes the Rockets line up with his sizzling hot guitar playing. Polished by playing for many years all over NSW, with bands like Radiators, Choirboys, Banned, Rock Soda. Marks talent is next to none and will have you spellbound as he pushes his acoustic or electric guitar to the limit constantly wowing audiences. Not only a great guitarist, Mark is a fantastic entertainer from Sydney and brings something ‘special' to Rocket. Dirty Dan, Graeme and Mark combine together to create Dirty Dan & the Rockets, a high energy, fun filled, and passionate, party band that deliver a great nights entertainment for any audience and venue. "Dirty Dan & the Rockets are ready to rock your next party or function - playing all the classic hits from the 60's to today's top ten!" 0434 541 736, or Toll free 1800 606 609. It is nice to know about the Dirty dan rockin, as a diverse entertainer. People wants more than music on their functions and parties and I think its a good combination of fun and music. I will recommend it to my boss. Good sound, very entertaining,an excellent reminder of what good pub bands sound like. The Big Blonde Guitarist is Awesome!